Marks & Spencer commissioned a poll in 2009 to find out the UK’s top favourite sweets and jellies. With more than 4,000 people taking part in the survey, M&S were able to find out the nation’s top favourite sweets. It may not come as a surprise but the fizzy cola bottle came out on top. The fizzy cola bottle has been a firm favourite for many decades. It is produced in the shape of the classic Coca-Cola bottles. Produced by many different companies, the sweets are found in most pick and mix selections. 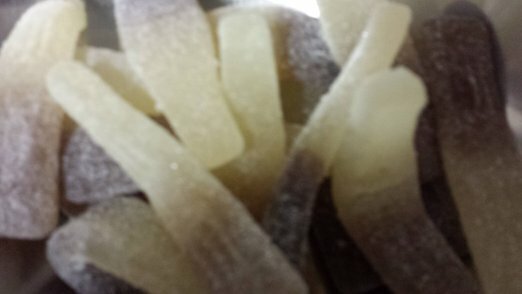 The fizzy and sour version is often more popular that it’s plain gummi cousin. If you know someone who is a huge cola bottle fan, why not treat them to a giant gummy cola bottle for their birthday! VAT19 in the States are selling a giant gummy cola bottle from their website. Measuring nearly eight inches long, each handmade cola bottle packs in an astonishing 1,080 calories and is available in a number of flavours. If you are a fan of the cola bottle and many other favourite jellies, why not consider a candy cart display for your next special event. With our stunning candy cart displays, you can select your favourite childhood sweets and jellies. Although, we don’t offer giant jellies, we are sure that we can come up with something to keep your guests happy!